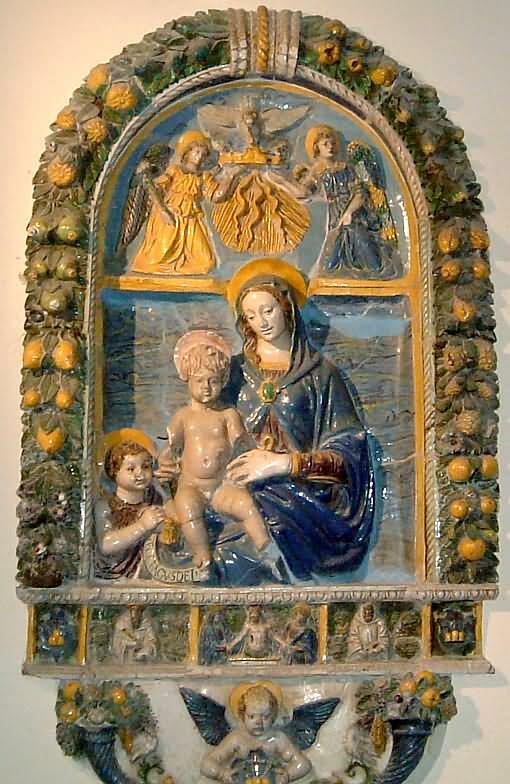 Finalpia Abbey has three samples of ceramics by Della Robbia school (mid of sixteenth century), very much appreciated as they are the only samples of this kind preserved in Liguria. This also testify the notable flowering of artistic activity in the Abbey during the mid of sixteenth century with a varieties of genre (inlay, miniature, painting, and ceramics) from the varied cultural stream (Tuscan, but also Venetian and Lombard) had their influence also if such stream still require an attentive critical consideration as for their origin and consistence. Of the three samples by Della Robbia school, two (anonymous) are situated respectively in the atrium and in sacristy, while the third, in the second cloister, is attributed to sculptor Buglioni Santi (1494-1576), student and collaborator of the last of the sculptors of the family Della Robbia, Giovanni. 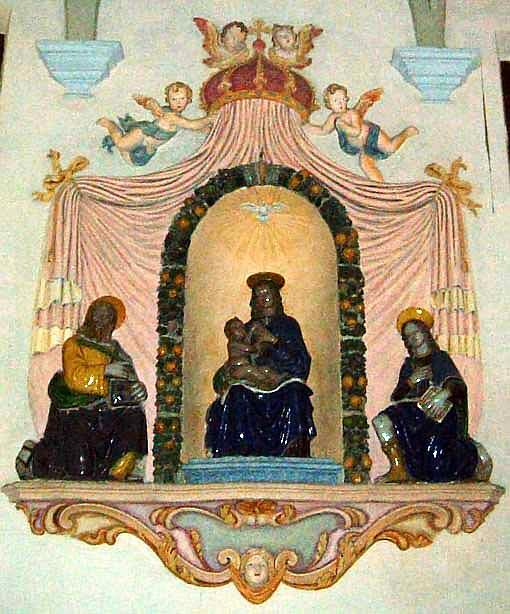 By Buglioni- also in terracotta- it is known especially the frieze with the seven Work of Mercy ("Lodge the pilgrims" in the Portico of the Hospital Ceppo of Pistoia, beyond other work in Florence and in several cities) is difficult to compile a complete list of his work because several of his works have been performed in collaboration with the Della Robbia and their students. Here we want to pause particularly on the Pity executed for the Finalpia’s Abbey; restored in 1993 by the ceramics restoration workshop in Albissola. 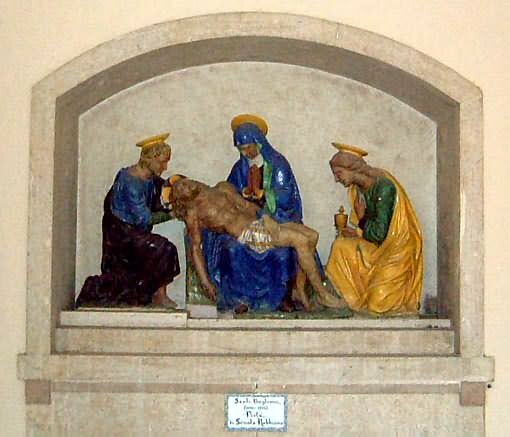 Such work, characterized also by the use of lot intense blue and yellow, typical of the last Della Robbia, represent Jesus on Maria’s knees and on her sides Saint John and Saint Mary Magdalene. In comparison to the others two samples, this presents first of all its own technical and stylistic characteristics. As for the technical point of view we note that the brightness of the enamelled terracotta is reserved to the drape of the characters while the human body, evidently to search a better realism, is dark and opaque. For what concern the esthetical point of view, the figures stand out, completely from the wall, but are more joined and connected between themselves and converge toward Christ’ body, possessing a better animation and looseness of movements that is translated in a more alive communication of feelings. The characters clearly stand out in the space that they themselves contributes to define while the action is centred on the main point reaching in this way a particular intensity of effect. Unlike the others two samples in the Pity are completely missing decorative elements or allegorical flowers and vegetable festoons, heraldic coats of arms or small figures situated in lower panels. The effect has entrusted entirely to the "truth" and drama of the evangelical episode and not to the monumental grandeur or to the scenic richness found in the others two samples. The scene is bare style and concentration is obtained thanks to the limited height (only 95 centimetres opposite to 2.20 meters and to 1.40 meter for the others two samples). As for the iconographic scheme is evident that the author could have drawn on the new model that had found his higher expression in the Vatican Pity by Michelangelo, at the start of sixteenth century, with Jesus on the knees of Maria and the relative position of his limbs especially of his legs. It was an explicit choice by the author, as still persisted, a consideration to different schemes. 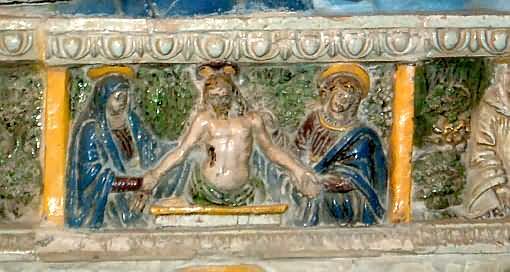 Also in Finalpia, the ceramic in the atrium shows in a lower panel, a small rectangular tile with the representation of the Pity where however Jesus is not laid down on Maria’s knees but he is standing upright. This show that in the same epoch and in the same environment were still present different schemes relative to the same iconographic subject, we observe the same thing also for the painting. It is been said, the representation of the Pity in Finalpia is based on a strong expressive realism (inherited by late Gothic) that reaches directly the observer without the addition of distracting or superfluous elements. Everything converges toward the body of Christ deposed from the cross and object of devoted care and attention by part of the characters. The intense communicative position of the scene conquers still today the mind of the observer and elevates him to higher thoughts of faith and adoration.